Water, poverty, and the environment are “intrinsically connected,” and the development programs targeting them should be as well, writes David Bonnardeaux in Linking Biodiversity Conservation and Water, Sanitation, and Hygiene: Experiences From sub-Saharan Africa, a new Africa Biodiversity Collaborative Group briefing. In a review of 43 programs across sub-Saharan Africa, including four in-depth case studies, Bonnardeaux finds that natural synergies between water, sanitation, and hygiene (WASH) programming and conservation work provide opportunities for greater effectiveness in addressing both. Given the connections between the two, WASH and conservation efforts would benefit from programmatic integration, according to Bonnardeaux. To bring the two closer together, he recommends three tools for policymakers and development programmers: integrated river basin management and basin planning; payments for watershed services (also known as payments for environmental services); and population, health, and environment (PHE) programming. dealing with freshwater ecosystems,” writes Bonnardeaux. In Tanzania’s Pangani River Basin, one of his in-depth case studies, a growing reliance on hydropower, urbanization, and increased agricultural demand is altering a valuable ecosystem marked by endemism and iconic landscapes, including Mount Kilimanjaro. In response, the government and international organizations are partnering through the Pangani River Basin Management Project to developing a greater understanding of the basin’s hydrology and ecosystem, how local populations interact with that ecosystem, and how potential development scenarios could impact the basin in the future. That knowledge, paired with an intensive training program for local water officials, is enabling stronger integrated resource management, which in turn could lay the groundwork for integrating WASH and conservation interventions, writes Bonnardeaux. Economic incentives – in this case, payments for watershed services – offer another valuable tool for building support for conservation efforts, especially when upstream communities bear a disproportionate burden of safeguarding watersheds. In South Africa, another case study country, “increased economic development and urbanization have taken its toll on” the country’s wetlands, while unemployment and poverty have remained a persistent problem in slum areas, writes Bonnardeaux. Through the government-run Working for Wetlands program, both the environmental and socioeconomic problems of development are being targeted for improvement. The program hires “the most marginalized from society” to clear wetlands of invasive plants in order to improve its natural filtration capabilities and, in turn, improves the quality of water feeding the burgeoning urban areas. Building support for conservation can be a difficult task. The impacts of conservation programming are “often undervalued,” Bonnardeaux writes, in part because results tend to become apparent only over the longer term. By pairing conservation efforts with nearer-term programming, like PHE efforts targeting immediate health needs, development workers can foster the kind of local support that is essential for pursuing long term goals. The Jane Goodall Institute’s Lake Tanganyika Catchment Reforestation and Education Project (TACARE), in northwest Tanzania, offers a case in point. Established in 1994, TACARE began as a conservation program meant to protect the areas around Gombe National Park, where Goodall first began her chimpanzee research in the 1960s. Local communities, however, were more interested in better health, “with an emphasis on clear water and reduction in water-borne diseases like cholera,” writes Bonnardeaux. By adopting local health and poverty priorities, he writes, TACARE was able to establish trust and goodwill with the communities it served, which in turn enabled it to pursue longer-term conservation goals aimed at protecting the region’s natural biodiversity. Bonnardeaux’s work shows that regardless of how policymakers choose to combine WASH and conservation goals, well-implemented integration can yield immense benefits for practitioners, funders, and local communities. 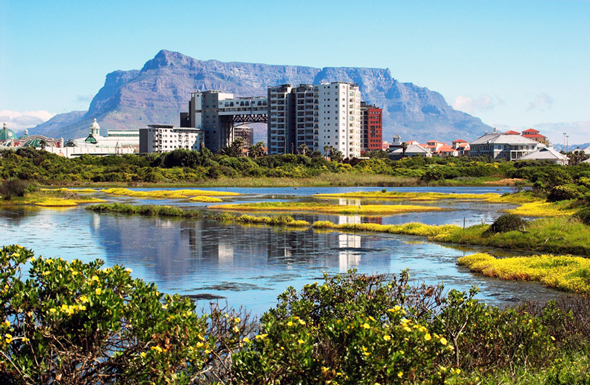 Photo Credit: “Intaka Island towards Table Mountain,” courtesy of flickr user Ian Junor.